Security requirements are still stalling the broader adoption of cloud applications. Organizations need to be able to see, control and monitor cloud application usage to help protect against cloud-delivered threats, policy violations and risky user behavior. One of the key challenges is that on-premises security products have a technology gap when it comes to cloud application usage and visibility. 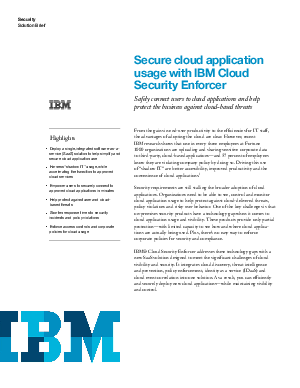 IBM® Cloud Security Enforcer addresses these technology gaps with a new SaaS solution designed to meet the significant challenges of cloud visibility and security.